The End of the Millennium Was in the First Century! I goes without saying that there is virtual unanimous agreement across all eschatological boundaries, that the destruction of “heaven and earth” and the resurrection occur at the end of the Millennium. I am unaware of any who deny this. The question, the identity, of the Millennium, when it began or when it will begin, and when it ended or will end, are theological questions of tremendous interest and significance. To some great degree, a person’s view of the Millennium will determine if they are a “Postmillennialist” i.e. that the coming of Christ occurs at the end of the Millennium (and this is the Amillennial view as well), or, whether they are a “Premillennialist” (whether Historic or Dispensational) believing that the Second Coming of Christ initiates the Millennium. Within the last few years another take – actually, two views – on the Millennium have gained popularity. One is the view that the Millennium actually began with the coming of the Lord in the judgment of Jerusalem in AD 70. This is the view espoused by James Jordan in our formal debate, held in Florida in 2003. (A book of that debate, [as well as MP3s], is available from this website). The view that the Millennium began in AD 70 is also the view of Duncan McKenzie and others. (https://www.amazon.com/Antichrist-Second-Coming-Examination-Revelation/dp/1619965798/ref=sr_1_1?s=books&ie=UTF8&qid=1534951782&sr=1-1&keywords=duncan+mckenzie). The other view, which I will present in this article, is the idea that the Millennium began with the ministry of Christ, and ended just prior to his coming in judgment of Jerusalem in AD 70. For ease of reference, I will refer to “the end of the Millennium in AD 70), when in fact, I believe that it ended just before AD 70. In my book, Who Is This Babylon? I have an extensive discussion of the Millennium. In 2012, I presented a paper at Criswell College in Dallas, Texas on “The Preterist View of the Millennium.” A CD of that presentation is available from me. I am convinced that there is a wealth of evidence to support the idea of a forty year Millennium. An examination of that material would take us beyond the limits of this series! So, while I could approach this subject from a variety of different perspectives, I will begin with what is granted by all futurist paradigms: The destruction of heaven and earth, along with the resurrection, is posited at the end of the Millennium. I will not even discuss here (except perhaps a few comments) the resurrection, although I believe that the evidence that the resurrection occurred at the end of the Old Covenant age in AD 70 is overwhelming and plentiful. My approach here is somewhat unique. I am unaware of any commentator that has approached the Millennium from this perspective. Part of the reason for this, perhaps the main reason, is because all futurist eschatologies posit the end of the Millennium in the future. This being taken for granted, the idea that the book of Revelation presents clear evidence that the end of the Millennium was in the first century with the judgment of Jerusalem is not even considered a viable possibility. This an a priori approach to the Millennium is unfortunate and blinds the eyes of the commentators to what appears to be very straight forward. The destruction of creation in the book of Revelation occurs at the end of the Millennium. The destruction of creation in the book of Revelation occurs at the judgment of Babylon, the Harlot city guilty of shedding all the blood of all the martyrs. (In other words, the end of the Millennium is the time of the vindication of the martyrs). Babylon in Revelation was Old Covenant Jerusalem. Therefore, the destruction of creation came at the end of the Millennium at the judgment of Old Covenant Jerusalem. In vindication (no pun intended) I will begin my presentation in Revelation 20. We will work our way backward from there as we examine the references to the destruction of creation in the Apocalypse. I have omitted verses 9-10, not because they are not important, but, because they are not directly related to the issue at hand, the termination of the millennium and passing of heaven and earth. (Yes, Gog and MaGog occur after the Millennium, but, that is a separate study. See my CD study of Gog and MaGog). I am focused for now on the passing of heaven and earth and the end of the Millennium. So, what do we have in Revelation 20? After the Millennium, we have the Great White Throne Judgment. At that judgment, the resurrection occurs. So, without any doubt whatsoever, “heaven and earth” pass away at the time of the judgment of the dead (As we shall see, Revelation 11, the judgment of the living and the dead, while not specifically mentioning the passing of creation, it is nonetheless parallel to Revelation 20). And more importantly, this judgment is the time of the vindication of the martyrs. Some believe that Revelation 20:1-4 speaks of the vindication of the martyrs at Christ’s coming in AD 70. But, that is untenable. Revelation 6 and the giving of the robes to the martyrs equates with the enthronement of the martyrs in Revelation 20:1-4. This is important and shows that Revelation 20:1-4 is not about AD 70. Jesus posited the vindication of the martyrs at his coming in judgment of Jerusalem in AD 70. That is certain and undeniable. What is important to see is that in Revelation 6 the martyrs are given robes and told to await their vindication at the Great Day of the Lord’s Wrath. The Great Day of the Lord’s Wrath is the day of their vindication, but, that is not the scene of Revelation 6:9-11, and therefore, it is not the scene of Revelation 20:1-4. To put this another way, AD 70 was the Great Day of the Lord in vindication of the martyrs. But, in Revelation 6 and 20, the vindication of the martyrs occurs after they receive their robes and are enthroned. They receive their robes and the thrones to wait for the Great Day of the Lord’s Wrath. The receiving of the robes and the thrones is not the final vindication. That means that the Great White Throne Judgment – after the Millennium – is the time of the vindication of the martyrs; it is AD 70. It is at that Great Judgment that heaven and earth passes. It is at that judgment that the martyrs are vindicated. To put this another way, heaven and earth pass away at the vindication of the martyrs. We will explore that in another upcoming article, so stay tuned. 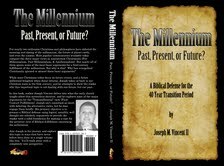 In the meantime, be sure to get a copy of Joseph Vincent’s excellent book, The Millennium: Past, Present or Future?